Get Your Yankee Swap/White Elephant Gifts Here! Here are just a few items that we carry that would be PERFECT to bring to your Yankee Swap/White Elephant gift exchange party! So often we will get through all our Christmas shopping and think we are done… and then we remember the stockings. We have put together a few ideas for stocking stuffers to help get the wheels in motion. It's July, and you know what that means? Waldo is back in town! 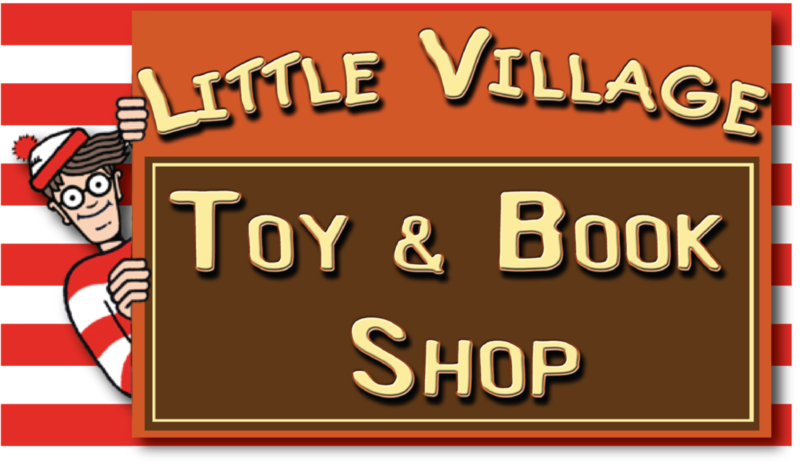 Little Village Toy & Book Shop will be hosting another exciting month-long scavenger hunt to find Waldo in participating local businesses in Littleton. Step 2- Visit the local businesses listed on the passport and hunt for Waldo. Once you spot Waldo, find an employee, secretly tell them where you spotted Waldo. They will sign your passport. Step 3- Collect as many signatures are you can. Once you have found as many as you can, bring your Passport back to Little village Toy & Book Shop. Make sure to fill out our contact information on the passport. The first 125 players who collect store stamps/ signatures from at least 10 different businesses and turn their passports into the book shop win an “I Found Waldo” button and a “$1 Off (Where's Waldo Books)” coupon. Players who collect at least 15 of the 20 possible stamps/signatures win an “I Found Waldo” button and a “$1 Off (Where's Waldo Books)” coupon PLUS they are entered in a drawing on July 28th for other larger prizes. Step 4- Join us on July 28th at 11am for our Where's Waldo Party where we will draw a lucky winner for all kinds of prizes. Be sure to pick up your #FindWaldoLocal passport at Little Village Toy & Book Shop so you can start searching on 7/1! Are you looking to connect with poets or find opportunities to hear or study poetry? To find poetry events and resources near you, simply go to: www.poets.org/poetsorg/poetry-near-you and enter your zip code in the search field. You can also click on the states menu and select your state to find festivals, conferences, writing programs, literary organizations, landmarks, poetry-friendly bookstores, and more in your area. You can also submit events with the Poets.org audience!